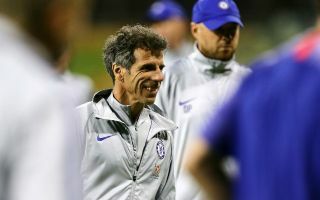 Chelsea assistant manager Gianfranco Zola could reportedly have a big role to play in helping the club seal the transfer of Nicolo Barella. The Italian has both played and managed Barella’s club Cagliari, and is said to know the player well as he has made a number of phone calls in an attempt to persuade him to move to Stamford Bridge, according to Il Matino, as translated by the Metro. The report states Barella can leave for around £45million, but it seems that it is the player’s indecision that is holding the deal up at the moment. Chelsea could do with more options in midfield and Barella is one of the brightest young prospects in Serie A at the moment. The 21-year-old looks to have a big future in the game and seems an ideal fit for the Blues under current manager Maurizio Sarri. The Sun are among the sources to strongly link Cesc Fabregas with a move to Monaco, and Barella seems to be in Chelsea’s mind as a like-for-like replacement in the middle of the park. CFC fans will now hope Zola can work his magic and lure Barella to west London this January.